When you have a zucchini plant that's going crazy like mine is, there's only one thing to do. Make bread! 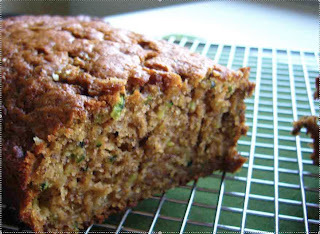 Even more than zucchini bread, I love zucchini banana bread. Adding banana to baked goods works best when the banana has gone black and it's well past the point you would want to eat it on its own. 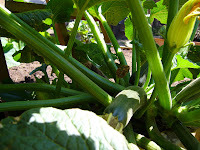 Shred zucchini by hand or using grating disc of a Cuisinart. Toss shredded zucchini with 1/2 cup flour and set aside. Combine 3/4 cup flour with next 9 ingredients and mix together. Stir in Zucchini and smashed banana. Spray loaf pan with cooking spray and pour in batter. Bake for 45 minutes and enjoy! It was delicious - thanks!